Another left wing piece of garbage that attacks our soldiers and conservatism. Awful with no redeeming qualities! The storyline had great potential to be entertaining but this is not it! The over use of n word and a major drug lord being the hero - really?!? By KL... The reason why people are giving this a bad review is because their small brains were ONLY entertained by the vicious killings and gruesome sufferings of the past 3 Purge movies, and failed to hear and see what the director/writer were conveying to them. The past 3 Purge movies gave us a very clear message. This last Purge movie blatantly told us of their plan, but short attention spans and an inability to have thought made this movie boring for the mindless masses. 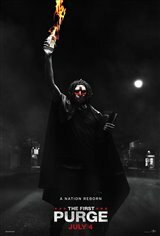 For the woke movie-goers and readers who were able to see the KKK, guerilla masks, and black face masks "make America great again" through this purge in the inner city at the hands of the government walked out of the movie, which solidified what they already knew. Albeit the movie is a bit exaggerated, but it's just conveying an important message. Remember, America was built on blood sacrifice of the Native Indians, and black slaves. What a pile of crap! Racist in every way to make everyone want to leave before it was over. Don't go watch unless you want to suffer through an awkward cringe fest. It's time we stop supporting movies that say it's okay to kill each other. There's too much of that on our streets these days. It's not okay. It rips families in two and creates heartbreak that the survivors of victims can never recover from. THIS IS THE WORST FILM MADE WITH THE PURGE FRANCHISE. NOT PLOT WAS NOT INTERESTING, DID NOT ATTRACT A LOT OF PEOPLE. STUPID ACTORS. YOU HAVE BEEN WARNED, DO NOT WATCH IS MOVIE IF YOU WANT TO SAVE TIME AND MONEY. What a sorry racist movie and the worst actors I have seen. Don't waist your time and money. I Love it.. The community of people Stands together..